To take the pulse of the biopharma industry, Life Science Leader tracked down four CEOs age 40 and under. These are the people at the forefront of innovation — something that is no easy task in a heavily regulated, patient-centered industry. Biotech is not tech. Heading up a company that is developing a pharmaceutical is a lot more challenging and riskier than starting one in your garage that is developing the next mobile phone app. If the industry is to foster innovation, however, it must make it easier for risk-taking young people to lead the way. Listed below, in alphabetical order, are four of the industry’s trailblazers. Ken Horne assumed the role as CEO of Symic Bio in 2014. The Emeryville, CA-based company had been founded a year earlier to develop therapeutics targeting the noncellular component (extracellular matrix) of the body’s tissues. These drugs are designed to inhibit pathological inflammatory responses and to affect matrix degradation and structure. Today the company has 34 employees. Two of its drugs, called matrix regulators, are currently in Phase 2a clinical trials, one for the treatment of peripheral artery disease and the other for osteoarthritis pain and disease modification. Horne is 37 years old and holds bachelor’s and master’s degrees in engineering from Stanford University. Before joining Symic Bio, Horne worked as a venture capitalist. He says he was drawn by the promise of the science to accept his current job as Symic’s CEO and remains motivated by the potential to impact patients in a positive way. Leen Kawas, 31, is CEO and president of Seattle-based M3 Biotechnology, which currently employs 10 people. Kawas has a Ph.D. in pharmacology from Washington State University (WSU) and, after becoming CEO, participated in an executive business-training program at the University of Washington. A native of Jordan, Kawas says entrepreneurship was not a concept common in her culture. So, it came as a surprise in 2013 when WSU professor Joe Harding asked Kawas, then a postdoctoral fellow, to help start the company based on their research on treatments for Alzheimer’s. Kawas was quickly promoted to CEO, deciding to learn the business of biotech by networking. A year later, she discovered she had connected with 719 people. Kawas says she now welcomes being outside her comfort zone, especially when she just might get to fulfill her childhood dream of curing disease. Hamza Suria was named president and CEO of AnaptysBio in 2011, six years after the company was founded. AnaptysBio, which went public in January 2017 and has approximately 60 employees, is in the business of developing drugs for severe inflammatory disorders, such as atopic dermatitis, peanut allergy, and asthma. Suria, 40, has a master’s degree in immunology from University of Western Ontario and an Executive MBA from the Richard Ivey School of Business. Suria says his focus has always been on the business end of biotech. He is motivated by the challenge of translating breakthrough science into value for patients and shareholders. Ilia Tikhomirov, 35, is the president and CEO of Formation Biologics, which recently opened an office in Austin, TX, and employs 12 people. Tikhomirov immigrated to Canada as a teenager and went on to earn an undergraduate degree from the University of Toronto, as well as a master’s degree in biotechnology and an MBA. Tikhomirov’s attempt at earning a Ph.D. ended when he realized the project he had proposed had great commercial promise and that, if he didn’t develop it himself, nobody else would. So, Tikhomirov started Formation Biologics in 2011. Today, Formation Biologics has closed multiple rounds of financing and has two drugs in development, one for the treatment of solid tumors, which recently started clinical trials, and one for the treatment of cancer and rare diseases, expected to start clinical trials in the beginning of 2018. 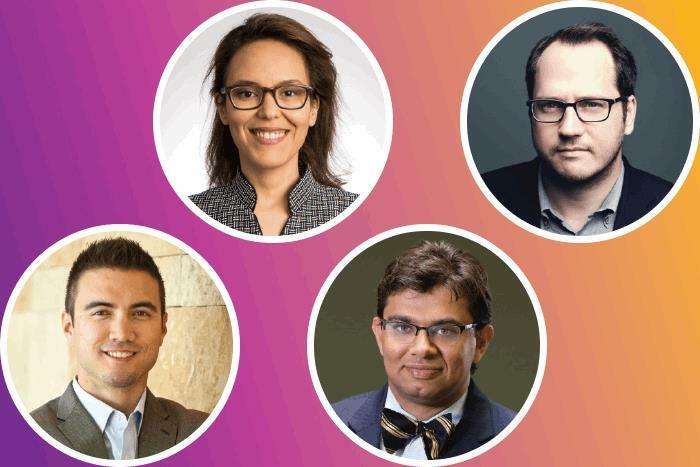 Life Science Leader turned to these young biotech entrepreneurs for insight on industry leadership, how to best foster innovation, and words of advice for those contemplating taking on the risk and rewards of running a startup pharmaceutical company. Their answers have been edited for brevity and clarity. LIFE SCIENCE LEADER: Why did you decide to take on the job as CEO of your company? HORNE: Symic Bio approached the venture fund I was working for looking for both capital and a CEO. I realized I would rather be a CEO on the operating side rather than remaining on the investor side. The science was compelling enough to lure me away from life as a VC. I feel closer to helping patients in my day-to-day life than I did as an investor. KAWAS: I was curious to see if I could do it, and, as it turns out, building a company is something that has suited me well. It is a job that needed to get done, so I decided to take it on. Business needs to focus on science and turn research into products that help people. When I was asked to help create an Alzheimer’s drug, I did not think about what it meant to be a CEO or even what it meant to build a company. I was focused on the goal of creating the drug. Being a CEO and building a company were the tools needed to achieve the goal. I enjoy the challenges that come with the position and the responsibilities. SURIA: My interest is in building value through the development of novel therapeutic drugs. With a team of motivated scientists and clinicians within the company, we will be able to advance the treatment of debilitating inflammatory diseases and create value for shareholders. Despite the challenges, I was excited about leading an organization that synthesizes the scientific and commercial considerations in taking new drugs to clinical trials, and hopefully commercial launch in the future. My background is in immunology, drug development, and corporate finance. I saw the CEO role as a unique challenge that would allow me to synthesize the various strategic elements required in biotechnology and be part of a team that executes important medical advances. TIKHOMIROV: I was young and stupid! And I wanted to bring my ideas to life. Actually, first of all, the company where I worked was very entrepreneurial and very open. The leadership exposed me to very different realms of drug development. They were talented people who readily shared their knowledge and expertise. This broad exposure gave me the confidence to start my own company. Second, in my family we have a tradition of entrepreneurship and social responsibility. If you can do something that could significantly affect people’s lives, especially if no one else is doing it, it is your responsibility to take it on. LSL: What prepared you to take on this leadership role? HORNE: Most recently, I was at a venture fund. You are seeing more and more CEOs with my phenotype. Historically, CEOs moved from operating into investing. I find the reversal of that trend to be a good thing. It doesn’t matter how smart you are. The lifeblood of a biotech company is private financing, so you need to be able to do it well. However, I am also fortunate enough to have had a CEO-like experience because I was the general manager of a portfolio company, running the company on behalf of my fund. It gave me confidence, and I learned the value in being able to draw upon a diversity of backgrounds within a company, especially when doing something no one has done before. KAWAS: Being a pharmacist and having a scientific education is helping me significantly. When making business decisions, it helps to know the science and vice versa. Thankfully, I grew up learning how to make decisions. It’s one of the hardest things about being a CEO. It’s all about making decisions, and you don’t get trained for that. My mom was a great role model for me. She ran one of the biggest hospitals in Jordan in a place that wasn’t as progressive as Seattle. I learned from her that being an effective leader is all about putting in the time and being genuine with people. I also was lucky to have strong advisors early on who mentored me and shared with me their experiences, both successes and failures. SURIA: I grew up surrounded by educated professionals who built businesses through entrepreneurship. As I made my way through school, I realized that new scientific technologies — whether in medicine, electronics, software, or manufacturing — were transforming the way our society was organized and valued. It became clear that learning technical skills alone was no longer going to be sufficient to succeed in the 21st century. The ability to translate new technologies on a commercial level would become critical. So, my education straddled the scientific and business realities of medicine, and my pre-CEO work experience focused on understanding the strategic choices leaders make in a biotechnology environment to unlock the commercial value of medical breakthroughs. I was fortunate enough to work with, and receive mentorship from, smart scientists and clinicians who had previously made the transition from medical science to the business leadership positions. They became role models for my career. TIKHOMIROV: It is easier to take risks when you are young. By the time people get all the basic scientific training and exposure they need to start on their own, they are usually in their 40s and have a family and responsibilities. It’s not the best time to be taking big risks. It’s one of the reasons we don’t have as many companies started and run by founders in biotech as there are in the IT industry. I think times are changing, and more young people can get mentoring and broad exposure earlier in their careers. It’s important that this trend continues. LSL: How could the biotech industry support more young leaders and entrepreneurs? HORNE: We need experienced people to step up and be mentors. I realized while I was in college that being the CEO of a life sciences company was my dream job. I sought out mentors and paid attention to what they did, what their career trajectories were, how you conduct yourself, and the need to be respectful of the people you want to lead. The most successful CEOs whom I had as mentors had a nonlinear path and a diverse skillset. Seeing that factored into how I mapped out my career. KAWAS: Despite my scientific training, I really wanted to understand the business concepts. So, I went to night school to study them. I was able to meet team members I am working with right now, but I think we need to officially train scientists in entrepreneurship in graduate school or have a separate program for scientists who want to be leaders in industry. It would be great to have a book aimed at scientists that outlines how to start a company and what it takes to be a really good leader. Maybe someone with experience reading this article will write that book. Conferences could focus on the entrepreneurship and the power of business to translate science. SURIA: Leadership in any industry, particularly in biotech, is a multifaceted responsibility that requires entrepreneurs to navigate between technical and business considerations. I believe the biotech industry needs to create opportunities for its emerging talent to gain first-hand experience across disciplines and not become pigeon-holed into either purely becoming scientists or solely focusing on business. Every biotechnology CEO needs to articulate their drug development strategy in the context of the company’s finance outlook and corporate development path. CEOs who cannot handle the cross-functional needs of their roles will be less suited for the challenges associated with financing the innovative medical opportunities of a biotech company. Our industry needs to foster education and mentorship to develop the next generation of cross-functional CEOs. TIKHOMIROV: There should be an innovation path. The most important ingredient of that path would be the exposure of young people by their employers to all the areas of our industry. Too many people work in silos in large companies. They need to interact with people and real projects. The IT industry benefitted tremendously from young people getting involved, sharing their energy, and providing a new perspective. We should find a way to unlock the same potential in our sector. LSL: What advice would you give to other young leaders who want to start a company or take on a leadership role? HORNE: If you are wondering whether or not you should be a CEO, you shouldn’t be a CEO. It is an extremely demanding job. It definitely shaves years off of your life. It is something that requires a lot of confidence. Some young CEOs surround themselves with people who don’t know what they are doing. Naysayers are the most important people to have around, especially in biotech where most people are at least 10 years older. It’s a heavily regulated industry, so experience is helpful. You have to find comfort in hiring someone who could probably take your job. That’s what makes people in my position successful. Hire the best possible people that you can. KAWAS: People need to realize that there is a significant amount of information that first year that entrepreneurs need to know. And to get that information, you have to talk to people. A lot of scientists don’t feel comfortable networking, but it’s critical to collaboration, meeting investors, and finding talent. SURIA: You need to align yourself with strong, smart people who are not just mentors but also role models. Find a leader whom you respect and can use to model your growth, behavior, and strategic thinking. Learn what helps them be successful. For scientists, gaining experience in managing complex financial situations or business alliances is critical to going beyond your scientific education. If you have a business background, make it a priority to understand how drug development decisions are made and how scientists make sense out of emerging breakthrough biology. Fill in the gaps in your background such that you are able to go back and forth between drug development and business strategy. TIKHOMIROV: First, from my own experience, there is a tremendous number of great ideas in our industry that never get developed. There is a lack of resources and people willing to take on these potentially breakthrough ideas that can help treat deadly diseases. If you see that kind of technology, you should take it on and develop it. But, you have to be passionate. Running a biotech company is tedious and complicated. If you care about what you are doing, it helps you to keep going. Second, be sure you surround yourself with very experienced people who have done this before. Third, even if you are not yet ready to start your own company, carefully watch our industry. Thirty to forty years ago you had to start a biotech company by building your own plant. There were huge up-front costs. Today, you can hire contract manufacturers to make and test drugs, as well as CROs to test them in human patients. The costs in biotech are still high, but they are only a fraction of what they were previously. Similar to IT industry in the twentieth century, this trend will continue and accelerate, which will create tremendous opportunities. As an industry, we are experiencing tectonic shifts.